Gillian Ayres was born in London in 1930 where she studied at the Camberwell School of Art 1946–1950. She was one of the first British painters to be influenced by American Abstract Expressionism and Colour Field painting. Ayres was among the artists who achieved prominence at the Situation exhibition in 1960. 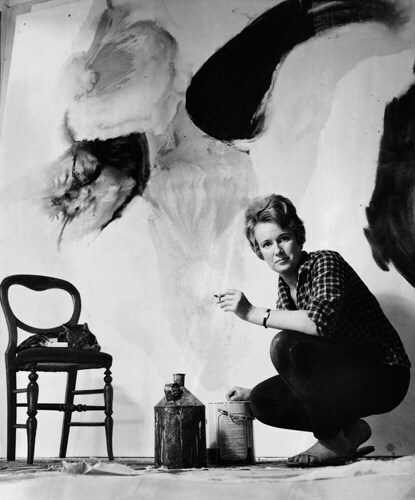 Some of her work in the 50’s made use of Pollocks drip technique and in the 60’s she did some lusciously coloured stain paintings. In the 70’s she introduced suggestions of floral motifs, creating some of the most sensuous images in recent British art. Ayres taught at the Bath Academy of Art, Corsham 1959 –66, St Martin School of Art, 1966 – 1978 and Winchester School of Art (as Head of Painting), 1979–81. She then moved to Wales and devoted herself fulltime to painting. Ayres was elected a member of the Royal Academy of Art in 1982, and in 1986 she was awarded the Order of the British Empire, and moved to Cornwall in 1987. Ayres’s work has been exhibited at The Museum of Modern Art, Oxford, The Serpentine Gallery, London, and the Royal Academy of Art, London, among others. In addition her work has been shown in various exhibitions of 20th century British Art all over the world. Ayres has also won various prizes including the Blackstone Prize twice at the RA Summer Exhibition and the Gold Medal at the 7th Triennale in India.